What should I know about blood sugar levels (ranges) in adults with type 1 or type 2 diabetes? What are normal fasting ranges for blood sugar? What are normal blood sugar levels before and after eating? What are high ranges for blood sugar levels? Are high levels of blood sugar in the blood dangerous? What can you do to help manage and prevent lower blood sugar levels? Normal sugar ranges or levels, mean the normal range of concentrations blood glucose levels (sugar) that occur in the blood measured by a test. Values that are below or above the range of values considered "normal" are abnormal. either too high or two low (hypoglycemia and hypercyglycemia). Diabetes is defined as a disease in which the body has an impaired ability to either produce or respond to the hormone insulin. People with type 1 diabetes have a pancreas that does not make insulin. People with type 2 diabetes have cells in the body that are resistant to insulin or have a pancreas that slows or stops producing adequate insulin levels (blood glucose). Both types of diabetes can result in abnormal glucose levels. Normal blood levels may range slightly depending on what blood tests are used, and your doctor may have, but the variances are small. In addition, what are “normal” ranges for nondiabetics are not the same for diabetics; it is generally accepted that target blood sugar measurements for people with diabetes will be slightly higher than those without diabetes. A person who is does not have a normal glucose range of 72-99mg/dL while fasting and up to 140mg/dL about 2 hours after eating. People with diabetes who have well-controlled glucose levels with medications have a different target glucose range. These people may have a fasting range of about 100 mg/dL or less and 180mg/dL about 2 hours after eating. If a person’s diabetes is not well controlled, the person may have much higher glucose ranges or hypoglycemia (for example, 200 -400 mg/d; however some people with diabetes have blood sugar levels that are much higher. High blood sugar or hyperglycemia is an abnormally high blood sugar (blood glucose) level in the blood. Hyperglycemia is a hallmark sign of diabetes (both type 1 diabetes and type 2 diabetes) and prediabetes. 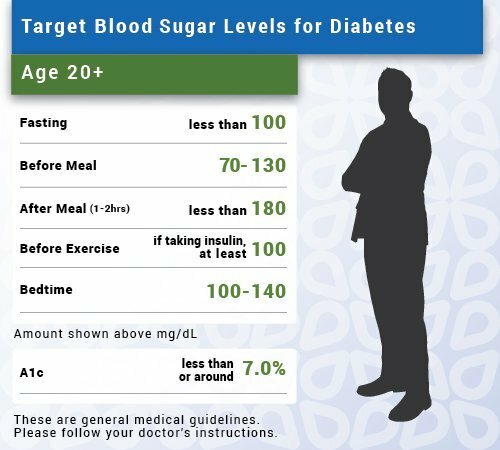 For people who do not have diabetes, normal blood sugar levels before eating or fasting range begins at 72-99mg/dL while fasting ranges for those being treated for type 1 or type 2 diabetes range from 80 -130 mg/dL. According to the American Diabetes Association normal blood sugar levels before and after eating should be 80-130 mg/dL before eating a meal (fasting), and less than 180 mg/dL about 1-2 hours after eating a meal. High blood sugar ranges for people who don’t have diabetes begins at 140 mg/dL or greater while for those being treated for diabetes, the high range begins at 180 mg/dL , called hypoglycemia. Yes, high blood sugar levels can be dangerous. Although high blood sugar levels commonly produce symptoms of excessive urination, excessive thirst and hunger, and weight loss, over time these high blood sugar levels can cause lower extremity paresthesias (“pins and needles” sensations) and/or loss of feeling, blurry vision and a tendency to be at higher risk for infections and many other medical problems including kidney and eye damage, heart attack, and stroke. Very high blood sugar levels (for example, 1000 or more mg/dL) can cause diabetic ketoacidosis, which can lead to loss of consciousness and possible death. The treatment for excessively high blood sugar involves IV fluids and insulin. Conversely, low blood sugar symptoms can cause problems such as hunger, nervousness, perspiration, dizziness and even confusion; if untreated, low blood sugar (also termed hypoglycemia) may result in unconsciousness, seizures, coma, or death. Low blood sugar levels begin at 70 mg/dL or less. People with diabetes who take too much medication (insulin) or take their usual amount but then eat less or exercise more than usual can develop hypoglycemia. Although much rarer, hypoglycemia may develop in some people without diabetes when they take someone else’s medication, have excessive alcohol consumption, develop severe hepatitis, or develop a rare tumor of the pancreas (insulinoma). The treatment for hypoglycemia is oral glucose intake (15. 0 grams of sugar, for example, 1 tablespoon of sugar, honey, corn syrup, or IV fluids containing glucose. Recheck your blood sugar levels in about 15 minutes after treatment is advised. A good start in how to maintain normal blood glucose is “How can you reduce your blood sugar levels” in this article. Eat foods high in carbohydrates and sugar such as buttered potatoes, fatty foods, candy, and sugary desserts like cake with frosting is a major step in your management of diabetes. Use a blood sugar log book with the date, time, and values of your or you and your doctor to help you manage your type 1 diabetes or type 2 diabetes, and use a blood glucose home test kit to get glucose test results. Additionally, log any change in symptoms over time. The log book will enable you and your doctor to modify treatments (for example, amount insulin to take) and actions to obtain the best management of your diabetes. Checking Your Blood Glucose. American Diabetes Association. Updated Oct 09, 2018. Khardori, R, MD, et al. Type 1 Diabetes Mellitus. Medscape. Updated: Oct 22, 2018. Khardori, R, MD, et al. Type 1 Diabetes Mellitus. Medscape. Updated: Apr 05, 2018. Please share your experience with low, normal, and high blood glucose levels. What symptoms did you have? How were the glucose levels treated? What problems with high or low blood glucose levels in the blood? How high did the levels get before or after eating? How did you treat it? How high did your blood glucose levels get? Were they life threatening? How were the levels lowered? High blood sugar can be a sign of diabetes or prediabetes. The drugs that treat it sometimes cause low blood sugar too. WebMD helps guide you through the effects of both. Diabetic ketoacidosis (DKA) is a complication of type 1 diabetes that is life threatening. If a person thinks they may have diabetic ketoacidosis they should seek medical care immediately. Diabetic ketoacidosis happens when a person's insulin levels in the blood become dangerously low. Symptoms of diabetic ketoacidosis include dehydration, abdominal pain, confusion, and nausea and vomiting. Diabetic ketoacidosis needs medical treatment. It cannot be treated at home. Diet changes along with other healthy lifestyle changes are important in treating prediabetes.